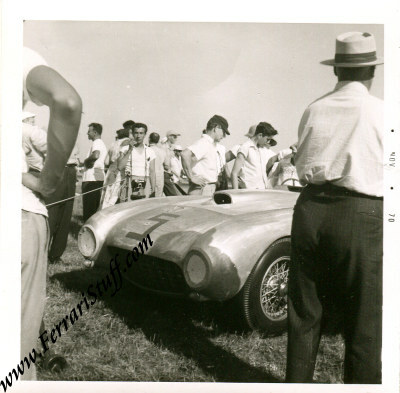 Vintage 1955 Photograph of Jim Kimberly's Ferrari 375MM S/N 0364AM at the SCCA Beverly Race 4th of July 1955. The photo can be dated so exactly as in February 1955, the trailer on which he car was being transported flipped over and the 4th of July race was the first race outing after the damage had been repaired but the car raced in bare aluminum... and that is very well recognizable in this photo. The car was recently auctioned by RM Auctions and set a new record for a 375 MM! This is a vintage November 1970 print, as it is dated on the white border. It measures some 9 x 6 cm or 3.5 x 2.4 inches.